All invoices, credit notes, orders and quotes can now be viewed online in a browser without having to log into the system. This is a powerful alternative to the PDF versions which are normally sent to your customers and suppliers. Ability to print a PDF version of the invoice at any time. Automatic update of any outstanding amounts. For example, if you enter a payment against the invoice in the system, then the online invoice will be immediately updated to reflect the payment. 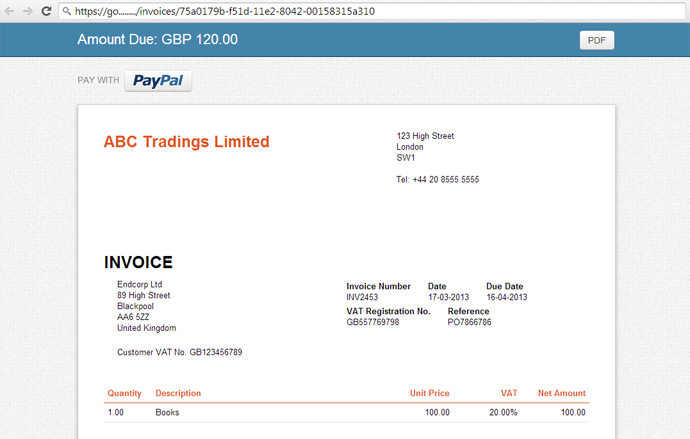 The online invoice also has enhanced PayPal integration. Where customers pay you via the PayPal link in the online invoice, an option exists to let the AccountsPortal software automatically create the payment transactions and match the invoices being paid. Automatic email notification when you have received a payment via an online invoice. A unique url is generated for each of your transactions and can be sent to your contacts enabling them to view the items online. For more information on how to get the most out of this feature, please have a look at Online Invoice Links.